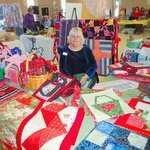 The Arts & Crafts Festival is Saturday, November 14, with all proceeds going to Outreach. There will be handmade items from parishioners and local artists, hand knit and crochet items by the Prayer Stitchers, musical entertainment from choir members, a bake sale, a book sale, and a huge raffle. For a list of vendors and pictures of their crafts click here. Read October Newsletter, page 3. We will begin collecting books for the book sale on Nov 1, so watch for information on where to bring them and start collecting them now.